High temp phenolic wheels are made for high temperature use. 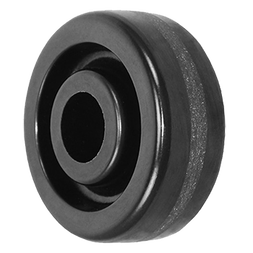 The high temp phenolic wheel is made in USA and resist to high shock, hard impact, oils and grease. The wheel offers floor protection, is non marking and non-conductive. Zerk fittings are available in 5, 6, 8 x 2 as well as all 2-1/2 and 3 wide phenolic wheels. The wheel is perfect for high temperature environments, such as powder coating, bakery ovens and dry heat autoclaves. It provides +475°F continuous heat resistance and +550°F intermittent heat resistance.